Last year’s Country Crafts junior winner. 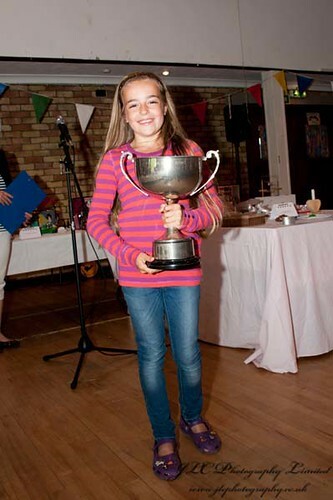 Photo: JLC Photography Ltd.
Thirty-one Country Craft categories have now been announced – giving you plenty of time to start getting creative across cookery, handicraft and floral crafts, as well as categories for the under 16’s. The Country Craft event will take place at The Village Hall, Somersham on Sunday 17th June. Many of the categories are inspired by this year’s theme of ‘Going For Gold’ – so now’s the time to put your (golden) thinking cap on! You should bring your entry (or entries) and completed registration form to the Village Hall from 9:30-11:30 on 17th June. Entry forms can be obtained from Somersham Library. There is a small entry of 50p for adults, 25p for children per item. Public viewing starts at 2pm. This is then followed by a presentation of prizes for each category from 3:30pm – including photographs of each winner. The judges are independent of the Carnival Committee. There is a door fee of 50p (adult), 25p (children), and the under 3yrs go free. Refreshments will be available from 2-4pm and are kindly provided by Parkhall Playgroup.